This page was developed to help remove the Help Recover Instructions Virus. 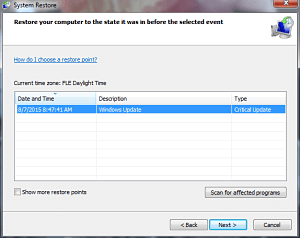 The Help Recover Instructions Virus removal guide is compatible with all versions of Windows. The Help Recover Instructions Virus is another reboot in a very successful line of ransomware viruses. Exactly like its predecessors it will remain concealed and begin encrypting your files one after another. It prefers to target all kinds of popular and widely used file formats such as .docx, .pdf, .txt, .mp3. Note that most ransomware viruses prefer to leave your system files intact so that you are able to respond to the ransomware demand. 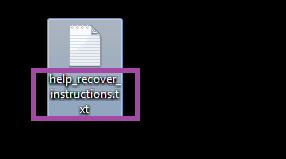 the Help Recover Instructions Virus is no different in this regard. In the past ransomware viruses did not actually encrypt your files, but rather locked your screen and made navigating through the computer impossible. Unfortunately, the modern version of ransomware is much more dangerous, but we’ll guide you through the necessary steps on how to deal with it. Generally, a ransomware virus can either be installed directly or indirectly – the latter is done via the help of a Trojan horse “dropper” virus. When installed directly the Help Recover Instructions Virus is usually contained within a self-extracting ZIP archive. This archive could reach your computer in many ways, but most of the time it is via either a mail attachment or from a corrupted source. Torrents and online storage sites often contain files that are actually virus infected and sometime thousands of people can download an infected file before it is recognized as such and taken down. Other times people may become victims of fake download pages that mirror your search terms and produce a fake file for download should you make the mistake of visiting such a site. CAUTION! We strongly advise our readers to stay away from all kinds of shady download sites – both P2P and direct download networks. If you absolutely have to download anything from such sites, make certain that you scan it for viruses before opening it. If you don’t have a virus scanner installed check for our recommendation. Infected emails are not always classified as spam – in fact they may even come from people you know and trust. There are many self-replicating viruses that will mail themselves to every person on the victim’s contact list. If an email looks odd, out of place or downright suspicious ABSOLUTELY never open any attached files. Ignore it or contact the person who sent you the email to clear things out. A Trojan horse installation is much more dangerous. It essentially means you have another virus already on your PC and that virus is capable of installing a variety of nasty presents (like the Help Recover Instructions Virus). These types of viruses are very sneaky and extremely hard to locate manually – download an anti-malware solution and let it scan your computer for the Trojan. You have probably already seen the threatening ransom message that the Help Recover Instructions Virus has created for you. The ransomware creators almost certainly demand that they be paid with a time limit and threaten to make your files unusable should you try to recover them in any other way. Ignore them – the only thing they are after is your money and they will do everything possible to fool you into paying. REMEMBER! Paying blackmail money to these cyber criminals should only ever be done as a last resort and only after all other options are exhausted. You are dealing with criminals who have no obligation to keep up their end of the bargain. Files encrypted by the ransomware can be decrypted only with the use of the key you are offered to buy, but there is another way. The encryption process does not actually edit or transform your files in any way – it merely creates encrypted copies of the originals. Once the copies are in place the original file is deleted. What we are going to do is try to reclaim the original files. If you swiftly you may be able to recover most, if not all, of your files. Just keep reading! The restoration process as described in the guide below does not touch the encrypted copies of your files in any way. You’ll always be able to take your chances with the ransom should you decide so. Symptoms Files on your computer acquire strange file extension and cannot be opened. Ransomware demands message will eventually pop. Distribution Method Email attachments, torrents, online storage sites, Trojan viruses. Do not skip this. the Help Recover Instructions Virus may have hidden some of its files. Your second option is a program called Shadow Volume Copies. Open the Shadow Explorer part of the package and choose the Drive (C or D usually) you want to restore information from. Right click on any file you want to restore and click Export on it. Definitely delete that line from the hosts file. Let me know if your PC is Ads free afterwards. At this point I am not sure. You can try clicking on one of the banners and download the program. If you don’t want to pay for it you can still use it to scan your computer. It will point to where the remain virus files are hidden. Delete them manually. Hope this works for you. Let me know of the outcome.